Truly, I do not have the gift of food photography. My garden is still producing zucchini so I have been baking zucchini bread like crazy so they don’t go to waste. My neighbors are going to gain weight because of me! I love chocolate so I was quite happy to find this Chocolate Zucchini Bread recipe on Allrecipes.com. 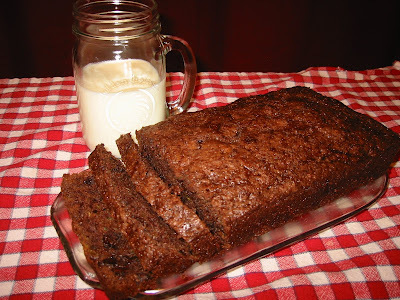 It is quite moist, which I like, and the chocolate adds some extra yumminess to the everyday zucchini bread. I do add an extra cup of zucchini, one: because I want to use up the zucchini, and two: because I think it adds to the moistness, and three: because it makes me feel less guilty about eating half of a loaf in one afternoon. Haha, unfortunately I still have some frozen from last year!